Design team member of Alpha Stamps, moderator at Craftster, lover of ephemera and junk. Welcome! Grab a cold one, kick off your shoes, and have a look around. 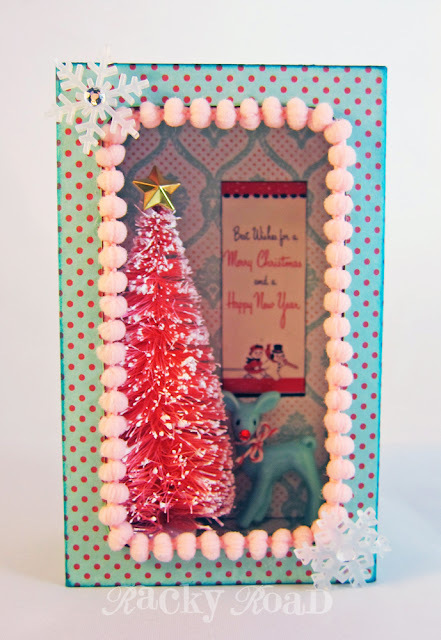 Be still my heart: PINK bottle brush Christmas trees! When I saw these trees I just had to do something with them! 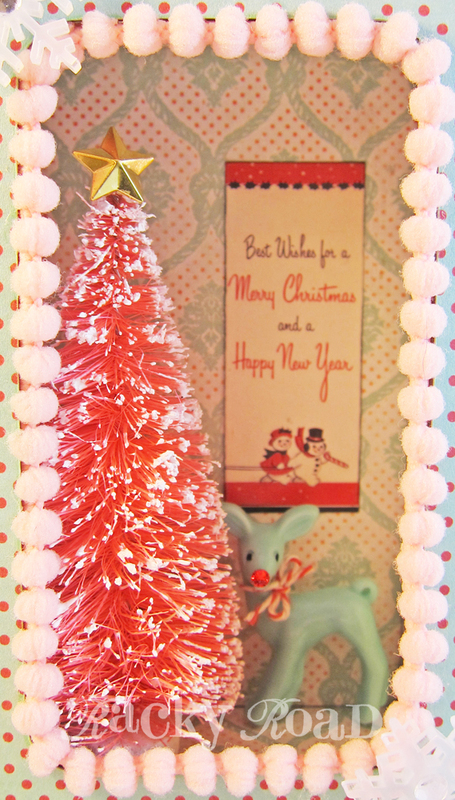 Using the new "3" by 5" Chunky Matchbox with Window" from Alpha Stamps, I made a little kitschy Christmas scene. 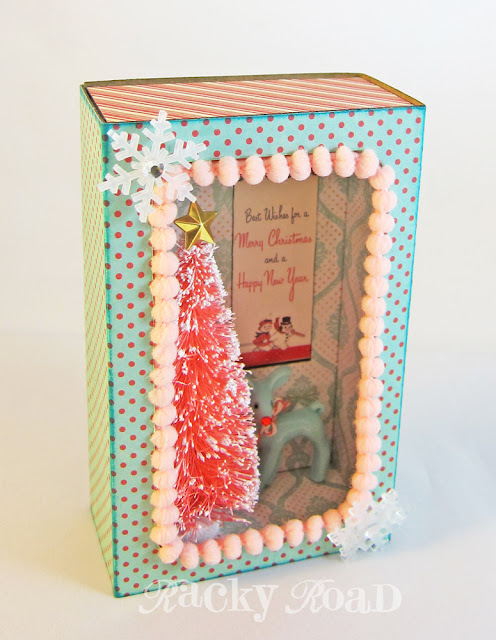 The pink tree looks great with my favorite color combo of turquoise and red, and of course I had to line the box opening with some pink pom poms. A little turquoise deer I had got a new set of eyes (spot of black paint) and a shiny red nose (tiny red crystal). I tied a little bit of baker's twine around his neck to make him dapper, and used a few layers of foam tape to attach him to the back of the box. The box top is flat when purchased. I find it easiest to cover by gluing paper to just the part of the box with the opening first, making sure you have enough paper to wrap around the sides and the back. 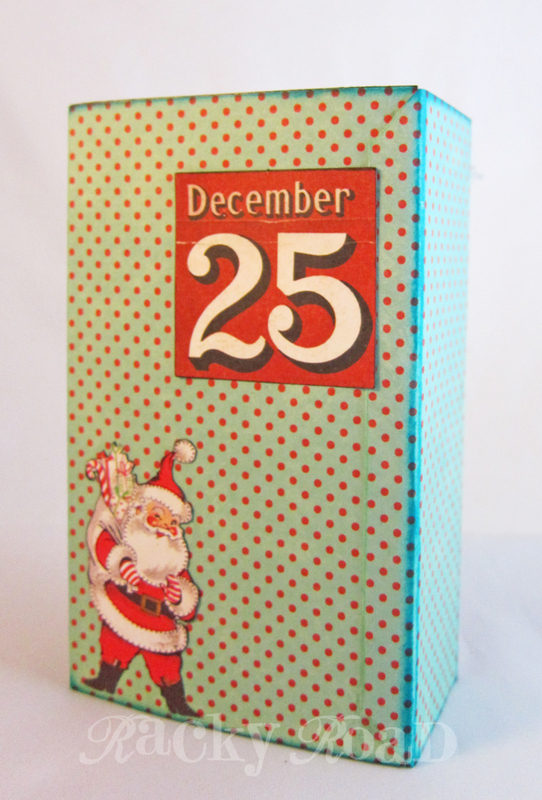 Then, cut out the opening with an x-acto knife before constructing the box top and then wrapping the paper around it. I chose a red and white striped paper for the top and bottom of the slide out box because they reminded me of a candy cane. This box is nice and deep, so for a better fit, I used scissors to flatten out the back of the tree a bit. Here's one more shot of the inside. Just for fun, I put a jolly little Santa on the back. Best wishes for a Merry Christmas and a Happy New Year! 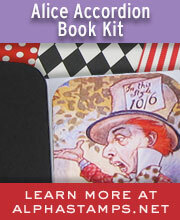 You can find most of the supplies I used here. And please come back next week, when I'll feature a smaller chunky Christmas matchbox. Hi Barb, the paper I used on the inside of the box is from Authentique's "Sea Maiden" collection. The individual sheet is "Sea Maiden Two". Alpha Stamps is sold out, but it looks like if you Google it, you should be able to find the set, and maybe even the individual sheet of paper itself, if that's all you need. I'm a Craftster Best of 2012 Winner!